y grandmother warned that the reward for work well done is more work . . . . It all started with a house In 1999, the Township approached the Museum—then housed in two rooms of the School Board Offices—to ask if we would take on the rehabilitation of an 18th century (in its oldest part) farmhouse being moved to parkland. Despite a modest membership and an annual budget that barely reached $5,000, we said “yes” to the more than $750,000 project. The house was moved in 2005. 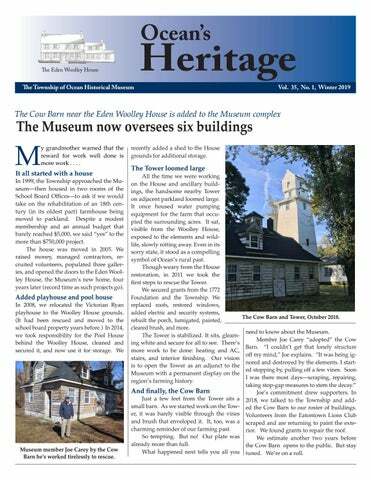 We raised money, managed contractors, recruited volunteers, populated three galleries, and opened the doors to the Eden Woolley House, the Museum’s new home, four years later (record time as such projects go). Museum member Joe Carey by the Cow Barn he’s worked tirelessly to rescue. recently added a shed to the House grounds for additional storage. The Tower loomed large All the time we were working on the House and ancillary buildings, the handsome nearby Tower on adjacent parkland loomed large. It once housed water pumping equipment for the farm that occupied the surrounding acres. It sat, visible from the Woolley House, exposed to the elements and wildlife, slowly rotting away. Even in its sorry state, it stood as a compelling symbol of Ocean’s rural past. Though weary from the House restoration, in 2011 we took the first steps to rescue the Tower. We secured grants from the 1772 Foundation and the Township. We replaced roofs, restored windows, added electric and security systems, The Cow Barn and Tower, October 2018. rebuilt the porch, fumigated, painted, cleared brush, and more. need to know about the Museum. The Tower is stabilized. It sits, gleamMember Joe Carey “adopted” the Cow ing white and secure for all to see. There’s Barn. “I couldn’t get that lonely structure more work to be done: heating and AC, off my mind,” Joe explains. “It was being igstairs, and interior finishing. Our vision nored and destroyed by the elements. I startis to open the Tower as an adjunct to the ed stopping by, pulling off a few vines. Soon Museum with a permanent display on the I was there most days—scraping, repairing, region’s farming history. taking stop-gap measures to stem the decay.” And finally, the Cow Barn Joe’s commitment drew supporters. In Just a few feet from the Tower sits a 2018, we talked to the Township and addsmall barn. As we started work on the Tow- ed the Cow Barn to our roster of buildings. er, it was barely visible through the vines Volunteers from the Eatontown Lions Club and brush that enveloped it. It, too, was a scraped and are returning to paint the extecharming reminder of our farming past. rior. We found grants to repair the roof. So tempting. But no! Our plate was We estimate another two years before already more than full. the Cow Barn opens to the public. But stay What happened next tells you all you tuned. We’re on a roll. Left: A new exhibit “Deal Test Site: 100 Years of History” opened in the Our Town Gallery on Holiday Weekend, December 1 and 2. Right: Cousins Thomas and Sarah Taylor (left) and Julianna Slick (right) played Woolley family members and entertained guests with stories and song. tique and homemade goodies bakery. Talented young docents brought the Woolley family to life for visitors young and old. The Deal Test Site exhibit is up through November. Nazi Germany appears on page six of this issue. Left to right: Ted Bell of Ocean Grove and Bob Waitt of Interlaken await their Hometown Histories interviews. Millie Susman’s winning raffle ticket was drawn the Sunday of the Holiday Open House. Here Millie, longtime Ocean resident and docent in the Museum’s third-grade program, picks up her hand-made quilt. The Museum is publishing a cookbook and we need recipes! Please send us your favorites by May 15. Drop them off at the Museum during regular hours, email them to alicejtimms@live.com, or mail them to the Museum at PO Box 516, Oakhurst, NJ 07755. Looking forward to hearing from all you good cooks out there. 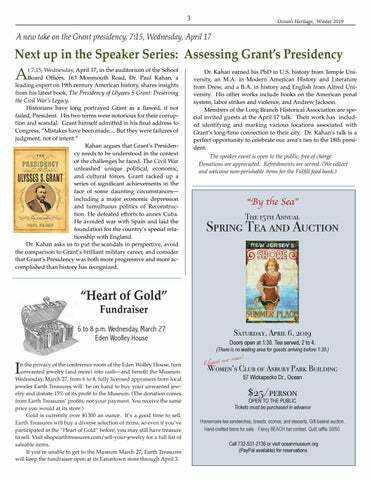 t 7:15, Wednesday, April 17, in the auditorium of the School Board Offices, 163 Monmouth Road, Dr. Paul Kahan, a leading expert on 19th century American history, shares insights from his latest book, The Presidency of Ulysees S Grant: Preserving the Civil War’s Legacy. Historians have long portrayed Grant as a flawed, if not failed, President. His two terms were notorious for their corruption and scandal. Grant himself admitted in his final address to Congress, ”Mistakes have been made.... But they were failures of judgment, not of intent.” Kahan argues that Grant’s Presidency needs to be understood in the context of the challenges he faced. The Civil War unleashed unique political, economic, and cultural forces. Grant racked up a series of significant achievements in the face of some daunting circumstances— including a major economic depression and tumultuous politics of Reconstruction. He defeated efforts to annex Cuba. He avoided war with Spain and laid the foundation for the country’s special relationship with England. Dr. Kahan asks us to put the scandals in perspective, avoid the comparison to Grant’s brilliant military career, and consider that Grant’s Presidency was both more progressive and more accomplished than history has recognized. n the privacy of the conference room of the Eden Wolley House, turn unwanted jewelry (and more) into cash—and benefit the Museum. Wednesday, March 27, from 6 to 8, fully licensed appraisers from local jeweler Earth Treasures will be on hand to buy your unwanted jewelry and donate 15% of its profit to the Museum. (The donation comes from Earth Treasures’ profits, not your payment. You receive the same price you would at its store.) Gold is currently over $1300 an ounce. It’s a good time to sell. Earth Treasures will buy a diverse selection of items, so even if you’ve participated in the “Heart of Gold” before, you may still have treasure to sell. Visit shopearthtreasures.com/sell-your-jewelry for a full list of saleable items. If you’re unable to get to the Museum March 27, Earth Treasures will keep the fundraiser open at its Eatontown store through April 3. OPEN TO THE PUBLIC Tickets must be purchased in advance Homemade tea sandwiches, breads, scones, and desserts. Gift-basket auction. Hand-crafted items for sale. Fancy BEACH hat contest. Quilt raffle. 50/50. Call 732-531-2136 or visit oceanmuseum.org (PayPal available) for reservations. nniversaries are meaningful milestones that shape our sense of who we are. 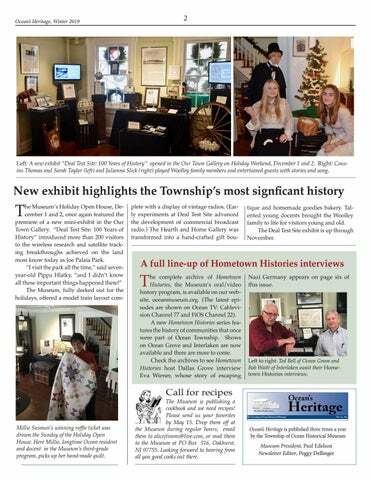 This year, the Township and Museum have three worth celebrating. the structure and fill its three galleries. In the ten years since, we have organized 22+ exhibits on our regional history, hosted more than 150 school visits, and opened the door to history to thousands through tours, speakers, newsletters, and videos. These anniversaries invite us to take advantage of the wisdom of hindsight. Behind each milestone were visionaries who could see beyond the challenges and inspire others to create something we cherish today. 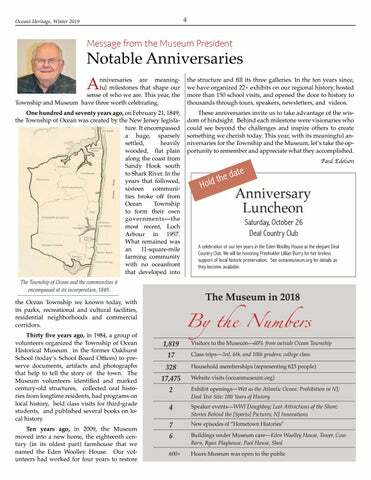 This year, with its meaningful anniversaries for the Township and the Museum, let’s take the opportunity to remember and appreciate what they accomplished. The Township of Ocean and the communities it encompassed at its incorporation, 1849. A celebration of our ten years in the Eden Woolley House at the elegant Deal Country Club. We will be honoring Freeholder Lillian Burry for her tireless support of local historic preservation. See oceanmuseum.org for details as they become available. the Ocean Township we known today, with its parks, recreational and cultural facilities, residential neighborhoods and commercial corridors. Thirty five years ago, in 1984, a group of volunteers organized the Township of Ocean Historical Museum in the former Oakhurst School (today’s School Board Offices) to preserve documents, artifacts and photographs that help to tell the story of the town. The Museum volunteers identified and marked century-old structures, collected oral histories from longtime residents, had programs on local history, held class visits for third-grade students, and published several books on local history. Eva Wiener lived with her family in Wanamassa from 1966, before moving to Neptune in 2002. She and her husband owned and operated Howard Lynn Shoes in Asbury Park and later Ocean Township. 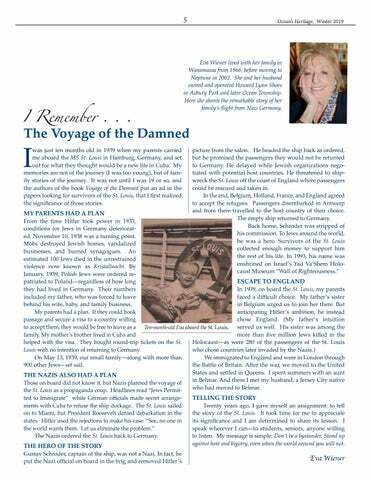 Here she shares the remarkable story of her family’s flight from Nazi Germany. was just ten months old in 1939 when my parents carried me aboard the MS St. Louis in Hamburg, Germany, and set out for what they thought would be a new life in Cuba. My memories are not of the journey (I was too young), but of family stories of the journey. It was not until I was 19 or so, and the authors of the book Voyage of the Damned put an ad in the papers looking for survivors of the St. Louis, that I first realized the significance of those stories. From the time Hitler took power in 1933, conditions for Jews in Germany deteriorated. November 10, 1938 was a turning point. Mobs destroyed Jewish homes, vandalized businesses, and burned synagogues. An estimated 100 Jews died in the unrestrained violence now known as Kristallnacht. By January, 1939, Polish Jews were ordered reESCAPE TO ENGLAND patriated to Poland—regardless of how long In 1939, on board the St. Louis, my parents they had lived in Germany. Their numbers faced a difficult choice. My father’s sister included my father, who was forced to leave in Belgium urged us to join her there. But behind his wife, baby, and family business. My parents had a plan. If they could book anticipating Hitler’s ambition, he instead passage and secure a visa to a country willing chose England. (My father’s intuition to accept them, they would be free to leave as a Ten-month-old Eva aboard the St. Louis. served us well. His sister was among the family. My mother’s brother lived in Cuba and more than five million Jews killed in the helped with the visa. They bought round-trip tickets on the St. Holocaust—as were 280 of the passengers of the St. Louis Louis with no intention of returning to Germany. who chose countries later invaded by the Nazis.) On May 13, 1939, our small family—along with more than We immigrated to England and were in London through 900 other Jews-- set sail. the Battle of Britain. After the war, we moved to the United States and settled in Queens. I spent summers with an aunt THE NAZIS ALSO HAD A PLAN in Belmar. And there I met my husband, a Jersey City native Those on board did not know it, but Nazis planned the voyage of who had moved to Belmar. the St. Louis as a propaganda coup. Headlines read “Jews Permitted to Immigrate” while German officials made secret arrangements with Cuba to refuse the ship dockage. The St. Louis sailed on to Miami, but President Roosevelt denied debarkation in the states. Hitler used the rejections to make his case: “See, no one in the world wants them. Let us eliminate the problem.” The Nazis ordered the St. Louis back to Germany. TELLING THE STORY Twenty years ago, I gave myself an assignment: to tell the story of the St. Louis. It took time for me to appreciate its significance and I am determined to share its lesson. I speak wherever I can—to students, seniors, anyone willing to listen. My message is simple: Don’t be a bystander. Stand up against hate and bigotry, even when the world around you will not. he Museum Board is made up of seven elected officers, six elected trustees, and a flexible number of appointed directors. The officers are elected to two-year terms. The trustees serve six-year overlapping terms. The officers and trustees are elected by the membership—this year by an e-ballot, emailed to members February 26, responses received by March 5. (Paper ballots were also available at the Museum.) Following the election, the officers and trustees meet to name the appointed directors and complete the Board, consistent with Museum’s strategic goals. President: Paul Edelson Three-term Museum President. Charter member of the Museum (former Trustee, budget committee, property management team, and more). 35+ years of community service (Zoning and Planning Boards, Board of Education, Boy Scouts). 1st Vice President (Events): Brenda Wityk Former President and Museum Director, two-term 1st VP. The force behind Museum gift auctions, the Flea Market, and fund-raisers. A leader in school and church communities. 2nd Vice President (Membership): Joan Brown New to the Board. Museum docent (3rd grade program). 43-year resident of Ocean. 19-year tenure as Director of the Wesley Nursery School (Oakhurst), recently retired. Community and church leader. Treasurer: Jack McCormack Two-term Treasurer. Retired Director of Information Systems Auditing for several Fortune 50 companies. Worked for McCormack, Baker and Neral, CPAs, and established their information technology department. Corresponding Secretary: Celeste Jones New to the Board. Long-time member. 50-year Ocean resident. Realtor for 30 years, currently with Century 21. Member of the Daughters of the American Revolution. Recording Secretary: Sergie Conklin Current Recording Secretary and former Corresponding and Recording Secretary, Museum docent, quilter, and living history interpreter. Became active in the Museum following her career as a social worker for the state of New Jersey. Museum Director: Marianne Wilensky New to the Board. Museum docent. 30-year Oakhurst resident. Professional community planner. 30 years with the Township Department of Community Planning; retiring in 2017 as its Director. Former member of Board of Education. rustees* Joal Leone (2019-2025) Continuing as a Trustee. The talent and energy behind the Museum’s hospitality at meeting and events. Phyllis Fyfe (2019-2025) New to the Board. 25-year active member. 54-year Oakhurst resident. 40-year school librarian, retiring from Ocean Township Intermediate School. Driving force and 54-year member of the Friends of the Library. 2002 Chamber of Commerce Volunteer of the Year. 2009 Ocean Township Employee of the Year. Ginny Richmond (filling unexpired 2017-2023 term) Museum President for ten years. Led the organization through the transition to the Woolley House. Former Museum Director. Retired teacher (20 years in the Long Branch School system). * Trustees serving unexpired terms--2015-2021: Eileen McCormack, Peggy Dellinger; 2017-2023: Marge Edelson, (John Huss stepped down from his Trusteeship). nce a year, Monmouth County’s most note-worthy historical sites open their doors to the public, free of charge, as part of the Weekend in Old Monmouth. The twoday event is a self-guided tour sponsored by the Board of Freeholders and the county Historical Commission. And once again, it features the Woolley House. Tour guidebooks, available at each site, including our Museum, describe the stops, suggest routes, and provide an easy-to-use map. Google “Weekend in Old Monmouth” for details. 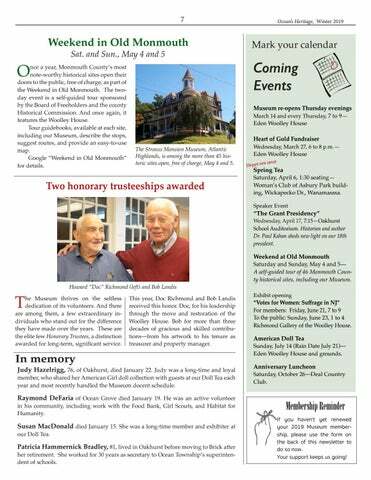 Heart of Gold Fundraiser The Strauss Mansion Museum, Atlantic Highlands, is among the more than 45 historic sites open, free of charge, May 4 and 5. “The Grant Presidency” Wednesday, April 17, 7:15—Oakhurst School Auditorium. Historian and author Dr. Paul Kahan sheds new light on our 18th president. he Museum thrives on the selfless dedication of its volunteers. And there are among them, a few extraordinary individuals who stand out for the difference they have made over the years. 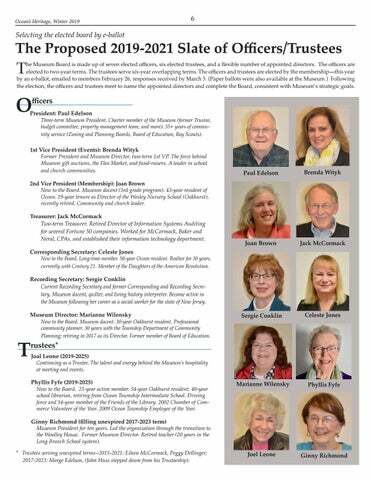 These are the elite few Honorary Trustees, a distinction awarded for long-term, significant service. This year, Doc Richmond and Bob Landis received this honor. Doc, for his leadership through the move and restoration of the Woolley House. Bob for more than three decades of gracious and skilled contributions—from his artwork to his tenure as treasurer and property manager. In memory Judy Hazelrigg, 76, of Oakhurst, died January 22. Judy was a long-time and loyal member, who shared her American Girl doll collection with guests at our Doll Tea each year and most recently handled the Museum docent schedule. Raymond DeFaria of Ocean Grove died January 19. He was an active volunteer in his community, including work with the Food Bank, Girl Scouts, and Habitat for Humanity. Susan MacDonald died January 15. She was a long-time member and exhibiter at our Doll Tea. Patricia Hammernick Bradley, 81, lived in Oakhurst before moving to Brick after her retirement. She worked for 30 years as secretary to Ocean Township’s superintendent of schools. “Votes for Women: Suffrage in NJ” For members: Friday, June 21, 7 to 9 To the public: Sunday, June 23, 1 to 4 Richmond Gallery of the Woolley House. American Doll Tea Sunday, July 14 (Rain Date July 21)— Eden Woolley House and grounds. Anniversary Luncheon Saturday, October 26—Deal Country Club. Membership Reminder If you haven’t yet renewed your 2019 Museum membership, please use the form on the back of this newsletter to do so now. Your support keeps us going! Oakhurst Schoolhouse, 163 Monmouth Rd. 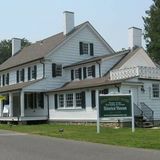 Tuesday, Wednesday, Thursday: 1 to 4 Thursday evening: 7 to 9 (April to November) 1st and 2nd Sundays of the month: 1 to 4 Funding has been made possible in part by an operating support grant from the New Jersey Historical Commission, a Division of the Department of State, through grant funds administered by the Monmouth County Historical Commission. Name(s) you would like to appear on your membership card and correspondence.